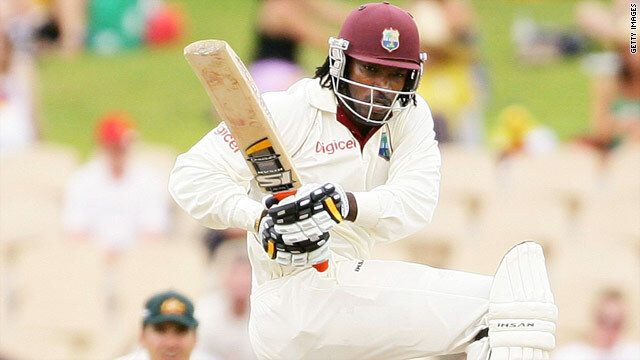 Chris Gayle plundered the fifth-fastest century of all-time to give West Indies a foothold in the third Test. (CNN) -- West Indies captain Chris Gayle produced one of the all-time great centuries in an exhilarating display on the second day of the third Test at Perth. The tourists, replying to Australia's first innings score of 520 for seven declared, closed at the WACA on 214 for two -- with Gayle starring on 102. Michael Hussey and Marcus North both missed out on becoming the first Australian batsmen this series to make centuries, the pair resuming on 81 and 23 with Australia's score on 339 for three. After Hussey fell for 82 early in the morning session and North suffered a concentration slip just before lunch on 68, Brad Haddin became the man most likely to end the Australian century drought. But midway through a fiery second session which saw Haddin and Mitchell Johnson clash angrily with West Indian spinner Sulieman Benn, the Australian wicketkeeper was caught behind off Kemar Roach for 88, becoming the 15th Australian player this series to reach 50 without going on to make a century. When Johnson was caught on the boundary for 35, Australian captain Ricky Ponting opted to declare, expecting to unleash his fired-up bowlers on a weakened West Indies batting line-up missing the injured Shivnarine Chanderpaul and opener Adrian Barath. But Australia found themselves on the wrong end of the fifth-fastest century in Test history, as Gayle's spectacular assault lit up their reply, while Travis Dowlin chipped in with 55. Gayle may have been fired up by the incident involving Benn and Johnson. He certainly paid special attention to the Australian pace bowler just before tea, hitting 34 runs off his four overs and having him removed from the attack. And, having reached 55 by the final break, the 10,000-strong crowd were treated to an absolute feast of shot-making in the final session as Gayle brought up his century in 70 balls -- 14 deliveries shy of Viv Richards' record for the fastest century ever. The innings included nine boundaries and six sixes, with Gayle bringing up the half-century and century milestones with shots over the ropes. Nathan Hauritz bore the brunt of the assault, hit for consecutive sixes in the first over he bowled before Gayle became just the second batsman after Mark Waugh to smash a six onto the top of the Lillee-Marsh stand roof. Gayle's innings ended after Ricky Ponting reintroduced Doug Bollinger to the attack -- with the captain's attempt at a square cut sailing directly to Shane Watson at point. Dowlin brought up his 50, but the opener -- in the side as a replacement for the injured Barath -- lost his wicket as he mistimed a drive off Johnson for 55. It left the unbeaten Ramnaresh Sarwan (42) and Narsingh Deonarine (10) to finish the day. While Gayle's fireworks dominated the day, match officials are almost certain to punish Benn, Haddin and Johnson for an ugly confrontation in the first over after lunch. The spat started with a mid-pitch collision between Johnson and Benn as Johnson headed to the non-striker's end, prompting a war of words between Haddin and Benn. Two balls later, Haddin prodded the ball back to the giant spinner, and a frustrated Benn went to take a shy at the batsman, prompting Haddin to jump away in alarm. Haddin's response was to come down the pitch and square up to Benn -- and things turned more unsavory when Johnson came in from the side to push the West Indian, forcing umpire Billy Bowden to hastily defuse a matter which will be looked at by match officials.